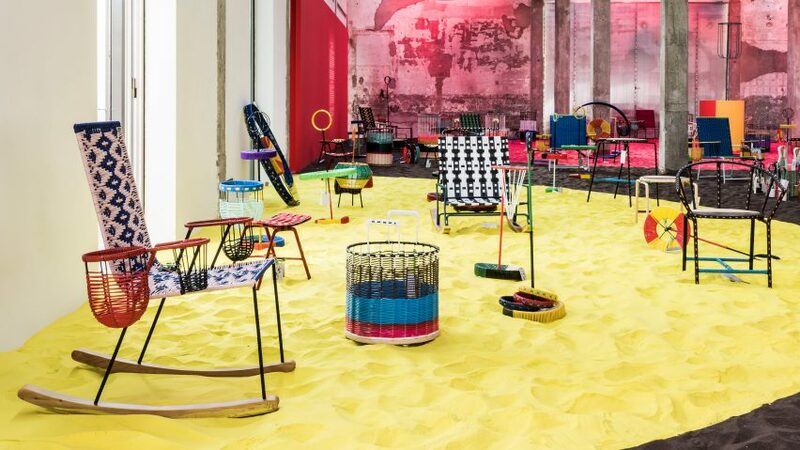 Fashion label Marni has designed a sandy playground for Milan design week that's filled with brightly coloured furniture and toys made using traditional weaving. The Marni Playland is made up of several different areas – marked out by brightly coloured circles of sand. In each, there are abstract reinterpretations of traditional playground equipment like swings and basketball hoops, as well as outdoor games like ring toss and push toys. Each piece has been left for visitors to interpret as they see fit, with many objects designed to encourage play – like bright cones and hoops, or purposefully oversized baskets. For those who want to settle down in the sand, there are also picnic blankets designed for the playground. 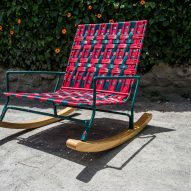 Scattered alongside the toys is furniture by the label, including rocking chairs, stools and seating with roofs. There are also armchairs that have scoop-shaped baskets attached to the arms, like miniature basketball hoops. 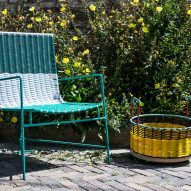 Marni worked with craftswomen in Colombia to create the collection, which is made from metal, painted wood and woven PVC cord. 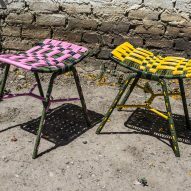 The furniture features brightly coloured checkerboard and striped patterns. Their decision to use a traditional technique echoes a recurring theme at Milan design week, which features several exhibitions dedicated to craft revival – including a showcase of updated Japanese lacquerware. 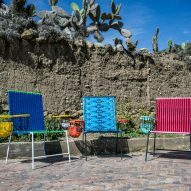 German designer Sebastian Herkner used a similar Colombian weaving technique for his brightly coloured Caribe collection of furniture, designed to add a "Caribbean mood" to interiors. 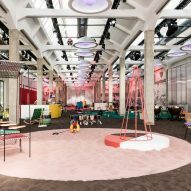 Marni Playland is on show from 6 to 9 April at the brand's showroom, located at Viale Umbria 42, during Milan design week. Marni plans to donate proceeds from sales of limited-edition products to children's charity Only the Brave, and will also host a children's workshop in the space. Other highlights from this year's Milan design week include a similarly playground-esque merry-go-round, filled with products by Lee Broom, and a tree-like installation that blossoms mist-filled bubbles, by Studio Swine.